Investing in small cap stocks has historically been a way to outperform the market, as small cap companies typically grow faster on average than the blue chips. That outperformance comes with a price, however, as there are occasional periods of higher volatility. The fourth quarter of 2018 is one of those periods, as the Russell 2000 ETF (IWM) has underperformed the larger S&P 500 ETF (SPY) by nearly 7 percentage points. Given that the funds we track tend to have a disproportionate amount of their portfolios in smaller cap stocks, they have seen some volatility in their portfolios too. Actually their moves are potentially one of the factors that contributed to this volatility. 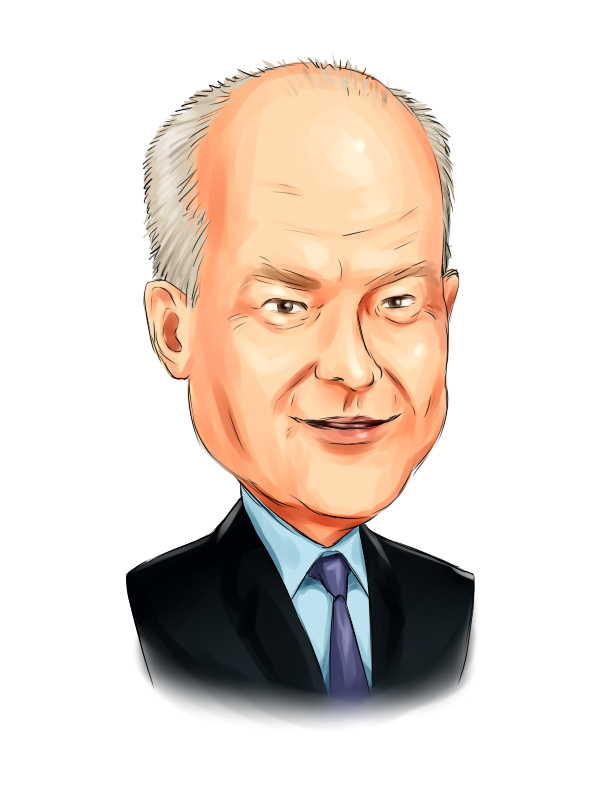 In this article, we use our extensive database of hedge fund holdings to find out what the smart money thinks of W.W. Grainger, Inc. (NYSE:GWW). Is W.W. Grainger, Inc. (NYSE:GWW) a buy right now? The smart money is taking a bearish view. The number of long hedge fund positions retreated by 7 lately. Our calculations also showed that GWW isn’t among the 30 most popular stocks among hedge funds. GWW was in 23 hedge funds’ portfolios at the end of December. 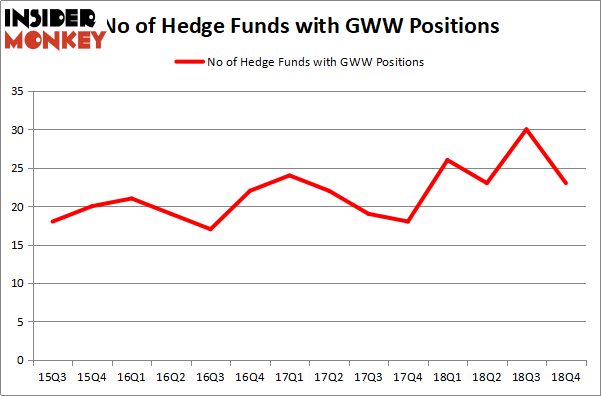 There were 30 hedge funds in our database with GWW positions at the end of the previous quarter. To the average investor there are many methods market participants use to analyze publicly traded companies. A pair of the less known methods are hedge fund and insider trading interest. We have shown that, historically, those who follow the top picks of the top investment managers can beat the S&P 500 by a solid margin (see the details here). Let’s take a look at the recent hedge fund action regarding W.W. Grainger, Inc. (NYSE:GWW). What does the smart money think about W.W. Grainger, Inc. (NYSE:GWW)? Heading into the first quarter of 2019, a total of 23 of the hedge funds tracked by Insider Monkey were bullish on this stock, a change of -23% from one quarter earlier. On the other hand, there were a total of 26 hedge funds with a bullish position in GWW a year ago. So, let’s find out which hedge funds were among the top holders of the stock and which hedge funds were making big moves. Among these funds, AQR Capital Management held the most valuable stake in W.W. Grainger, Inc. (NYSE:GWW), which was worth $84.6 million at the end of the third quarter. On the second spot was Two Sigma Advisors which amassed $48.6 million worth of shares. Moreover, Carlson Capital, Citadel Investment Group, and D E Shaw were also bullish on W.W. Grainger, Inc. (NYSE:GWW), allocating a large percentage of their portfolios to this stock. Since W.W. Grainger, Inc. (NYSE:GWW) has witnessed a decline in interest from hedge fund managers, we can see that there lies a certain “tier” of funds that slashed their entire stakes in the third quarter. Interestingly, Jim Simons’s Renaissance Technologies sold off the largest position of the “upper crust” of funds tracked by Insider Monkey, worth about $62.6 million in stock, and Jeffrey Talpins’s Element Capital Management was right behind this move, as the fund sold off about $33.6 million worth. These bearish behaviors are intriguing to say the least, as aggregate hedge fund interest was cut by 7 funds in the third quarter. Let’s check out hedge fund activity in other stocks – not necessarily in the same industry as W.W. Grainger, Inc. (NYSE:GWW) but similarly valued. We will take a look at Arista Networks Inc (NYSE:ANET), First Data Corporation (NYSE:FDC), Barrick Gold Corporation (NYSE:ABX), and AmerisourceBergen Corporation (NYSE:ABC). This group of stocks’ market valuations match GWW’s market valuation. As you can see these stocks had an average of 36.25 hedge funds with bullish positions and the average amount invested in these stocks was $979 million. That figure was $261 million in GWW’s case. First Data Corporation (NYSE:FDC) is the most popular stock in this table. On the other hand Arista Networks Inc (NYSE:ANET) is the least popular one with only 23 bullish hedge fund positions. Compared to these stocks W.W. Grainger, Inc. (NYSE:GWW) is even less popular than ANET. Our calculations showed that top 15 most popular stocks among hedge funds returned 19.7% through March 15th and outperformed the S&P 500 ETF (SPY) by 6.6 percentage points. Unfortunately GWW wasn’t in this group. Hedge funds that bet on GWW were disappointed as the stock returned 5.7% and underperformed the market by more than 7 percentage points. If you are interested in investing in large cap stocks, you should check out the top 15 hedge fund stocks as 13 of these outperformed the market.